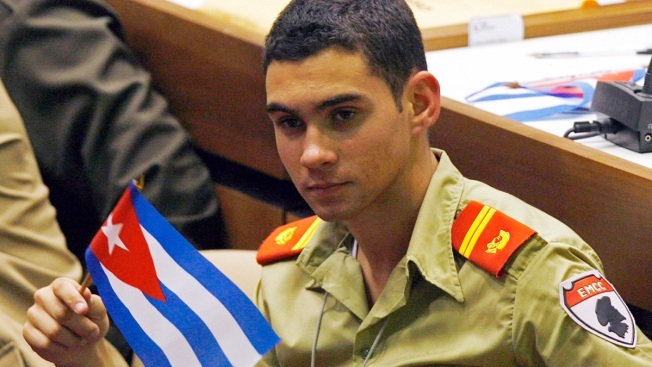 FILE - In this April 4, 2010 file photo, Elian Gonzalez holds a Cuban flag during the Union of Young Communists congress in Havana, Cuba. Gonzalez, the Cuban boy at the center of an international custody battle nearly 20 years ago in April 2000, has joined Twitter after Cuba announced 3G internet access for cell phone users. Elian González Brotóns, the man who was once at the center of an international custody battle which involved the U.S. and Cuban governments, has joined Twitter. González Brotóns posted his first tweet on Thursday, the same day Cuba announced that they would be allowing its citizens full internet access for mobile phones. His Twitter handle, @BrotonsElian, appears to pay tribute to his deceased mother, Elizabeth Brotóns, who drowned in 2000 while fleeing Cuba with González. No es casualidad que me una a Twitter en mi cumpleaños 25, lo hago para agradecer las felicitaciones de mi Presidente Miguel Díaz-Canel y desde aquí poder seguirlo y apoyarlo. Recuerden usted y los cubanos dignos a los que se refirió que mi principal meta será no defraudarlos. On Thursday, President Díaz-Canel wished González Brotóns a happy birthday on Twitter, and referred to him as the son and grandson of “Cubans with dignity,” and all of Cuba. The tweet went on to say that the battle for his freedom, led by Cuban leader Fidel Castro, showed how they can overcome challenges together. In 2000, González Brotóns was just shy of his sixth birthday when the small boat carrying him, his mother and a dozen others went down near Florida. González Brotóns’s mother was among those who perished. Elian was found floating in an inner tube and rescued by a fisherman who then turned the small boy over to U.S. officials. González Brotóns would then become the center of a bitter custody battle between his relatives in Miami who wished to keep him in the United States and his father, Juan Miguel González, who wanted him returned to Cuba. The international custody battle became a hot button issue during the 2000 U.S. presidential campaign and a central focus for the U.S. and Cuban governments. The months-long saga culminated with a dramatic raid on the Miami house, where U.S. federal agents retrieved Gonzalez at gunpoint in the early morning hours and he was flown back to the island in June of 2000, where he rejoined his father. The iconic photo of that historic moment, taken by Alan Diaz for The Associated Press, won the 2001 Pulitzer Prize for Breaking News Photography.